after an hour in the garden, planting out peas, courgettes and runner beans, and while I wait for Mum's lunch to cook. I'm not usually a fizzy drink gal, but right now, straight from the fridge, it's just hitting the spot. Well, I'm officially an old fogey now! Off to claim my bus pass, concessionary rates, the last seat on a crowded bus, a shopping trolley I can knock into the legs of others, oh, and so much more!! (Don't worry, I was joking about the last one!) If I wanted one pic to sum up how I feel, this would have to be it. I'm DELIGHTED you found us via Julia. That makes my day. I had to laugh at the Old Fogey joke. I don't know that seniors get special rates on buses here in the States, but if I ever move to England, I'll wait till I'm of that age when people are asking what I'm up to (grin). 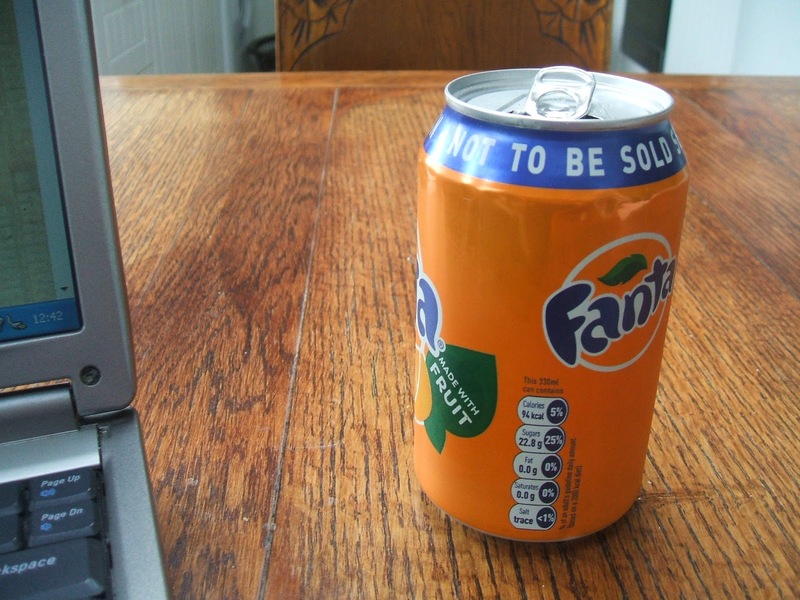 And thanks too for sharing your "not to be sold" Fanta with us this lovely T Tuesday. Sadly, here the wind is so fierce, all you can see is dust and more dust. Your time in the garden sounds perfectly lovely and a refreshing drink is certainly in order! Happy T Day...nice that you are joining in...the more the merrier! your garden sounds wonderful. :) we have overcast clouds, but there's promise of sun later. we'll see. hope your t tuesday is a delight! sounds like a wonderful garden-I like how you used the French name of the zucchini :) So glad to have you join us for T day! And I do agree that after a day of yard work a nice cold fizzy drink does taste especially good. Love the attitude of the card-a very happy birthday to you! I agree, that a fizzy drink is always much better after working in the yard/garden on a beautiful day. Both are so satisfying. Thanks for the visit this week and the wonderful comment. Hope to see you again. Hello and Happy T Day! 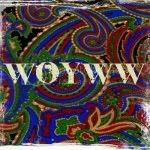 So glad your joining us this week, it's quite addicting and you will learn so much about everything. A cold fizzy drink after garden sounds good to me. We also garden and I can't wait for the warm weather to come so we can get it started. LOVE the funny sentiments here, my parents would love them too I bet. They are always laughing at themselves and their senior citizens discounts. Hello and Happy Tuesday! I too like a little fizzy in my drink. I generally don;t drink pop but I do like club soda...I often cut fruit juice with it to give myself a bubbly treat. Laughed at your card :) lots of bonuses being 'of age', hope you had a lovely Birthday! Haa Haa! I just L'd OL on your caption! Very sad as I am on my own! Enjoy your can, though I do hope you have cleaned it first, or you use a straw!! Just sayin'! Love that cartoon! Although I'd like them to say, What is that sweet little old lady up to now? LOL! Does that mean you're 60? I could get the senior bus pass at 60, but some places it may be more or less. 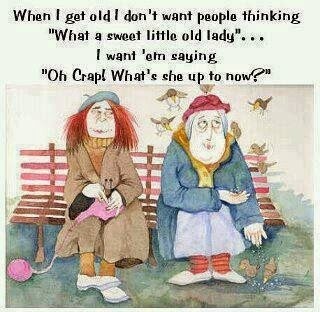 ;) I think I'm officially an old crone now that I'm 63--LOL! Welcome to T-Day! I'm running very late this week, but I hope you had a nice day on Tuesday. With that cold Fanta, it looks like you did.